Take Southern State Pkwy. to Exit 33 (Rt. 109 East - Babylon). Continue to Wellwood Avenue and turn right(South). Continue past Sunrise Highway and turn right on Hoffman Avenue (immediately after the LIRR track). Turn left on Broadway and continue to Knights of Columbus located on left side of road. Take Southern State Pkwy. to Exit 35 S (Wellwood Avenue). Continue past Sunrise Highway and turn right on Hoffman Avenue (immediately after the LIRR track). Turn left on Broadway and continue to Knights of Columbus located on left side of road. Take Long Island Expy. (Exit 49 S) or Northern State Pkwy. (Exit 39 S) to Route 110 South. Continue to Route 109 East. Continue on Route 109 East to Wellwood Avenue and turn right(South). Continue past Sunrise Highway and turn right on Hoffman Avenue (immediately after the LIRR track). 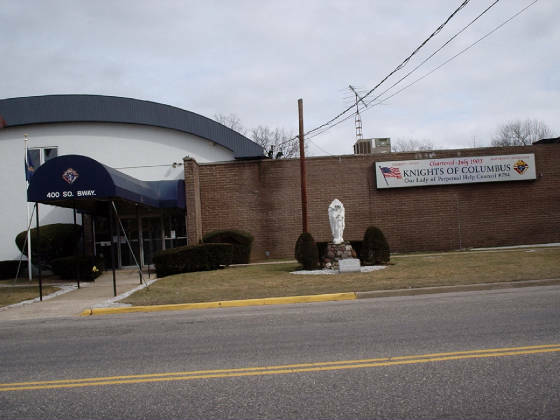 Turn left on Broadway and continue to Knights of Columbus located on left side of road.